It’s not too often I outright copy Trena and make something because I saw hers. I mean, I get salty when I give her unloved fabric and she turns it into a masterpiece. When? Like this shirt and this dress. I already know I’m going to be mad when she sews this fabric from China. Four years ago Trena made (now out of print) Simplicity 3503 and I was j-e-a-l-o-u-s. Don’t get me wrong, I’d made my own version and a version for a friend. But, Trena’s was stunning with the use of border prints. And, the version for me I gave away to Liz because I didn’t understand a FBA back then. Once I knew I needed an FBA, I just didn’t like the way the dress fit. Ann, if you ever ever ever get that fabric again, please send me a telegram. 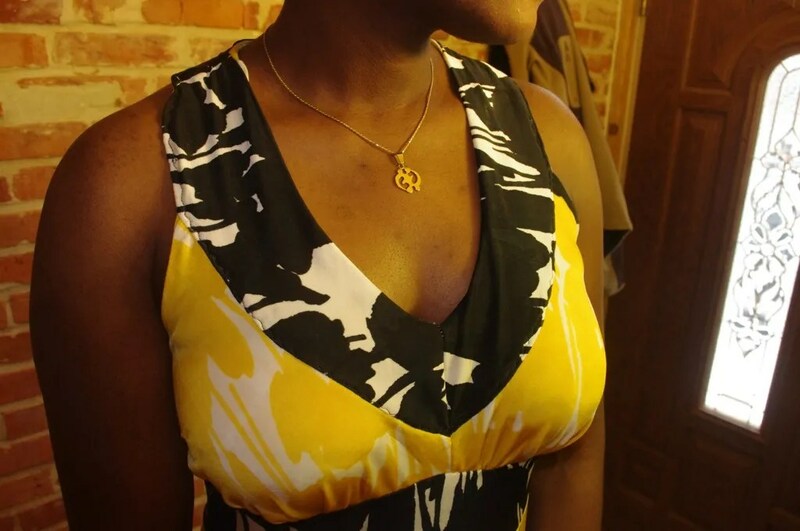 So, here’s my newest Simplicity 3503 (complete with a FBA), a good four years after the maxi dress trend peaked, lol. I’ve wanted to add more yellow to my wardrobe the last two years too. The fabric was in my stash from Fabric Mart and I scooped up an additional two yards at the DelMarVa blogger meet up last fall. I needed it too because of the way I wanted to cut out and place the various prints. This is one of the prettiest things I’ve made lately. But, guys. It’s a kind of a hot, happy-hands-at-home mess. 1. I really really detest facings and sewing knits by turning under and stitching from the outside (wrong sides facing each other). I think it never looks nice and always looks homemade. My halter looks all kinds of janky on the outside edges because of it. And, I’ve already pressed the life out of it. The inside of the dress is also self-lined. 2. To get the waist to fit nicely (I really shoulda/ coulda cut a whole size or two smaller), I took in the waist a few inches. I forgot that my facing knit at the waist band is SUPER stable. Which meant I couldn’t get the dress on after taking it in as it wouldn’t stretch in the waist. To ‘fix’ that, I just sliced into the facing at the sides. Now, I could rip out the waist, recut and resew. But, I’m already not happy with the way the halter looks. I am going to put this dress in the magic closet and see if I have the energy at some point to redo the waist. But, for now. I just don’t have it in me. You can see a little peek of my bra on the left under my arm. Well, that’s after I took the straps up by two inches on each side. 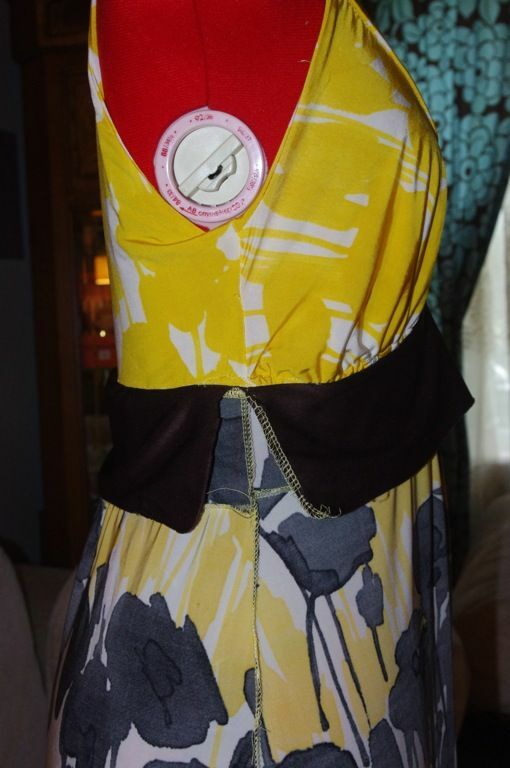 I also made a one inch FBA and shortened the dress by four inches. Half of this was sewn on my new-to-me serger, the Babylock Imagine. So far, I am in love. 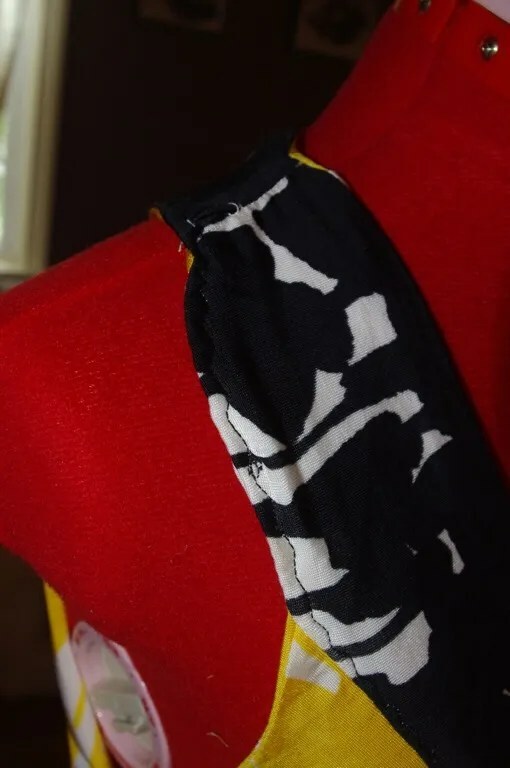 I’ll do a separate post on it after I’ve sewn a few more items. But, this garment also made me get a serger. My Euro-Pro was chewing up and eating holes (while shredding and breaking threads) in this dress and many of the other knits I’ve tried to sew the last year. I was so frustrated I wanted to *throw* it against a wall. It has served me well low these past 8 years. But, at $400 for the price from HSN. It has served its purpose and I bid it adieu to the sewing machine farm in the sky. I wore the dress today to a wedding/ logistics- rehearsal. I’m officiating the wedding next weekend at my friends’ home. 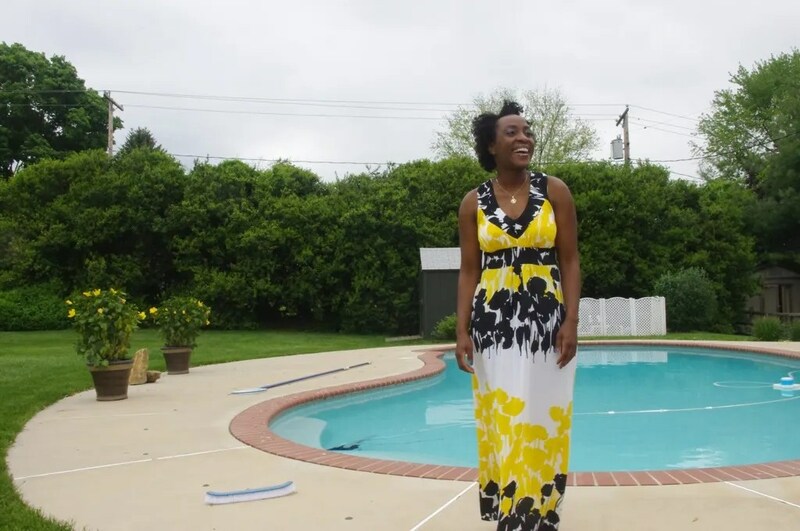 Doesn’t a maxi dress just make you think of Miami and a pool? In my mind I’m making something new to wear. But, I haven’t even started…. Wow, that is so stunning in that border print! I remember when that was for sale on the FM site – it didn’t grab me, but you really made it sing. I agree completely with Carole- until you point out the flaws you see, no one will see anything other than a great dress! 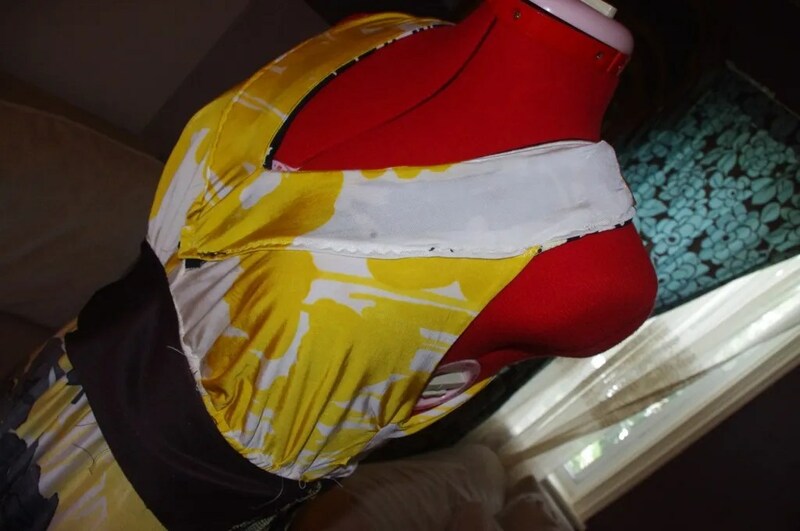 I love the way you lined up the print- I thought I’d never wear yellow but I would totally wear this dress! Trend or no trend, it looks gorgeous on you. This dress looks lovely on you. I didn’t have great success with the pattern. Your dress is gorgeous! It looks beautiful on you! Beautiful dress on you! I know what you mean about reaching for perfection- go for it! It is a gorgeous dress, love the color combination! Question for you: what is an FBA?? Thanks for your time! The dress is actually stunning on you. The print is absolutely gorgeous. You should NOT shove this into the closet. WEAR IT. Hope this gives you some ideas about how to manage those pesky, slippery knits! Gorgeous dress, you look fabulous. I think this dress is stunning on you! I feel you on the janky inside and seam ripping, redoing, taking in, etc… I’ve really been struggling with my latest project. Sometimes it gets to a point where the inside may look less than desirable but the outside looks fabulous! And that’s wht counts, amirite? I don’t care what you say that dress is stunning on you! Forget the so-called “flaws” – this dress is gawjuss on you! 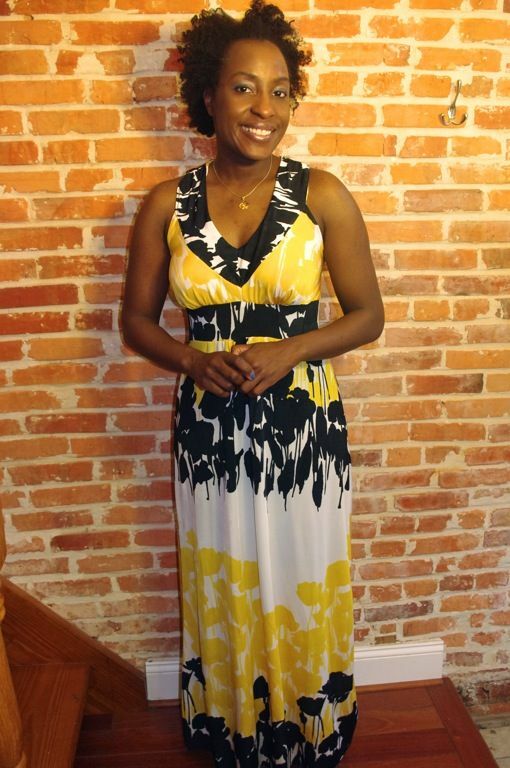 Seriously, I must make me a maxi dress…. Gorgeous! Beautiful use of print and I love the color combo! This maxi dress is gorgeous, you look absolute beautiful, wow! I want my fabric back now, please. It’s a great dress. I love the pattern and the style. It looks great on you. regarding the issue of removing serging. Use a needle and pick at the ends. You will have several thread strands. Pull on the shortest one and the serging will come right out. Love it looks fantastic. And who cares what the inside looks like. With pieces that are trendy or the fabric was very low cost I figure I will get some good seasonal wear from them and they will move out of my wardrobe. I am not building furniture, just cute dresses that won’t fall apart on me. Looking good! and the color combo is so striking on you. you are making me want a maxi and I don’t even like wearing them. I’m sorry it didn’t turn out as well as hoped, because the fabric is spectacular in this pattern! You used the print perfectly. It’s gorgeous! It does seem to fit better than your last version. FBA’s, or any fit adjustments, make such a big difference! I hope the maxi dress trend is still going strong. They are one of my favorite things to wear. Divine! The print is amazing! Forget the ‘flaws’ only you will see them. The fit is great and you look really wonderful in this color combo. Nice setting. This is soooo beautiful! I think people will be so mesmerized by your beautiful fabric that the imperfections will go unnoticed! You should wear your dress proudly b/c it’s gorgeous! I love your maxi dresses, they are beautiful. I read the comment you made about the fabric from the first one and I have some of it in my stash – 2 pieces: 1 yard and 2 yards. I don’t know if I will ever sew it, I love it but it’s too much print for me. If you are interested let me know Will you see my email in the form below? Mary, I would be interested in purchasing this fabric – if Ms Celie does not need it! Your dress looks fantastic and those colours pop! You could always cover the halter edges with a piping of some sort, if the stitching bothers you that much…but I agree with the. 3 ft rule too. This dress is FABULOUS! You look amazing in it, like a Grecian goddess or something! It’s gorgeous! If I had only look at the pictures of you wearing the dress, I would NEVER have guessed any of your sewing issues. It looks beautiful on you and your use of the print was fabulous! You forgot this one, http://theslapdashsewist.blogspot.com/2012/01/vogue-1020-side-gather-dress-in.html. Heh. Love this on you! Everyone’s wardrobe should have more yellow in it. The print and color placement on this are just perfect. What are you wearing to officiate???? It looks fabulous on you! Wear it proudly. the dress and fabric are a great match. i know this pattern is out of print, but i took a chance and FOUND IT AT WALMART!!!!!! I’ve been seeing it all over the internet, and am so happy! now to gain the courage to actually MAKE it up! 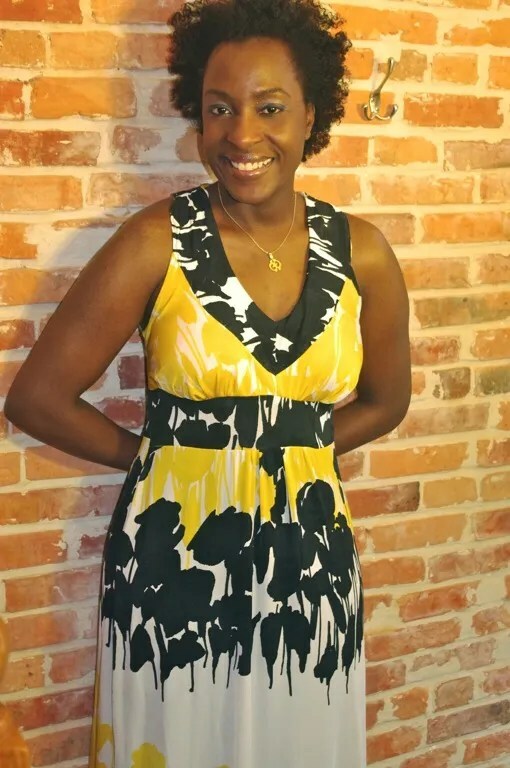 No one is going to notice the little sewing hiccups you can see, I love the way you have used the print and it seems to me maxi dresses are in every summer so hopefully this one won’t have to spend too long in the magic closet before you love it again. I’m so sorry that you have/had so much truoble with this dress. I think it’s beautiful and you look gorgeous in it. Renee, what a great dress! 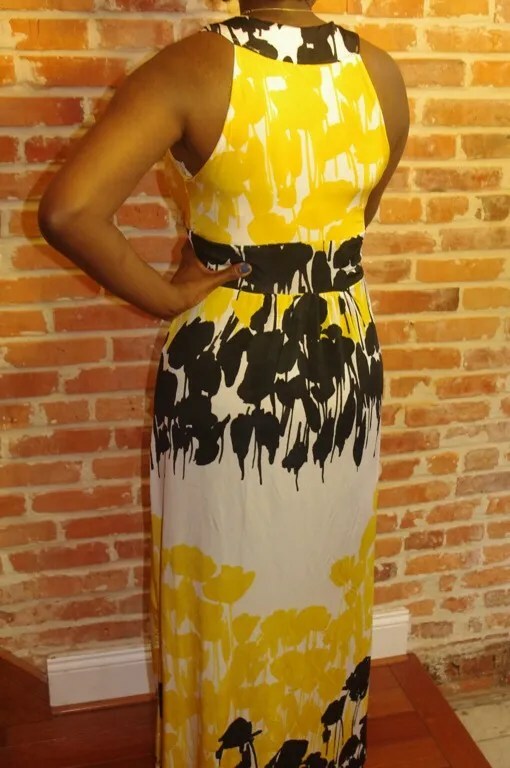 You should definitely wear more bright yellow.. more black-white prints… and more maxis! This is your best ever, IMO. I love how it turn out, And the colors are Fabulous… Love it….